View of the Barton Aqueduct in Lancashire. It was built in 1761 by the great northern engineer Joseph Brindley (1716-1772). 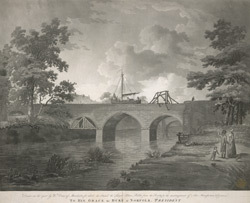 While building a canal for the Duke of Bridgewater from Worsley to Manchester, he had to resolve the problem of how to cross the River Irwell. Rather than building locks, he designed this aqueduct which was completed in 1761. It was one of the great industrial sites for 18th century visitors who marvelled at the prospect on ships on the aqueduct sailing over ships below on the river!